c4c has reached its ten year anniversary this year and to celebrate held a ball at the Ampfield Golf Club. Just to make this an even more special event James and Alice were flown over curtesy of the trustees, to join the celebrations and give a first-hand report on the progress of the Life Centre Primary School. For Alice, it was her first ever trip out of Kenya and the first time she was able to thank in person all the supporters over here in the UK. 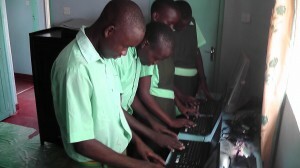 A visit to Asante was a must and, whilst there, they were pleased to receive 4 laptop computers to take back with them resented by the Rotary Club of Romsey Test. (Pictured). Later this month on the 14th October many of the staff and volunteers will be walking the Test Way. This is an annual event organised by the Rotary to raise money for local charities. Jude Gregory and Shirley Barter (trustees) will be joined by two volunteers David and Janet Dawson, visiting Kenya on the 22nd October. They will be able to see the graduation ceremony 2018. Life Centre School has been performing really well with excellent results. A full report will follow. The laptop computers have given many pupils their first taste of IT and have been a massive boost to their studies. See how they got on below.